Although there are countless aviation and war documentaries, there's only a few that glide above the crowd and the History Chanel's Dogfights is one of these series. Beautifully narrated by Phil Crowley who truly encompasses the viewer, Dogfights the Complete Season One carefully combines archival footage, computer animation, interviews and the like to create a truly inspirational and engaging documentary series. Although the series details the planes themselves, the information goes beyond just the battles such as the pilots behind them and the culture of the various political climates and of course research into flight. The interviewees of the documentary accurately recount their tales of war and matched with the impressive computer generated images, they assist in recreating some of the world's most dangerous battles. It should be noted that the parallels between the different aspects of war such as land and air are almost like chalk and cheese and battles in the air generally only lasted for a few minutes as opposed to soldiers bunkering down. Thankfully the series shows both sides of the battle and showcases a wide variety of wars from the World War II to the little known Six Day War in 1967. From modern jets to classic biplanes of World War I where the dogfights originated from, Dogfights the Complete Season One highlights the changes of war from machine gun fire to bombs and finally the deadly missiles that changed the face of war. 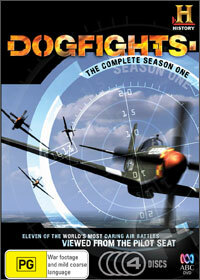 With decent video quality, especially the re-enactments, Dogfights the Complete Season One is a very impressive documentary that lovers of planes will simply adore and with Father's Day just around the corner, this is one DVD that many dad's would thoroughly appreciate.